Heck's permit was issued by Ray Reifendifer. On the history section of the Bloomsburg Fair's website, it states that Reifendifer was the fair's superintendent of concessions in 1954, so he was likely one of their key personnel for many years. 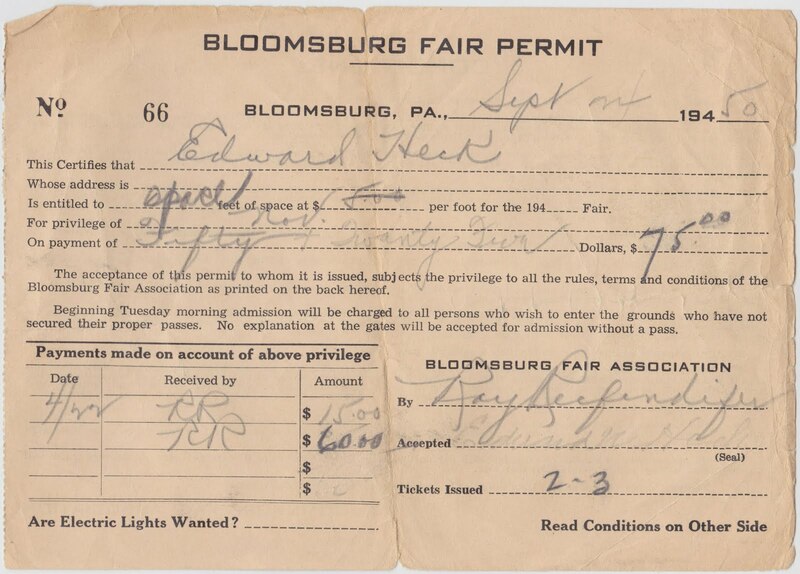 The business for which this privilege is granted shall at all times be subject to inspection by the officials or agents of the Bloomsburg Fair Association, as to its proper and legal conduct. Said Association to be the sole judge of this, and shall have power to annul the privilege immediately, if thought to be for the best interest of the Association. This permit entitles the holder to sell and carry on such business only as mentioned on the face hereof. All gambling, buy backs, skillows2, drop cases, roll downs, tracks, pick outs, dart games, sheet writers, auction jams, pitch games, big six, immoral, vulgar, suggestive shows, shows for men only, displays or performances, and all controlled games are positively prohibited or any other that the Association may see fit to prohibit. Be sure to have all supplies needed for each day on the ground before 10:00 o'clock in the morning. No delivery trucks will be admitted or allowed on the ground after that hour. Electric current and connection from the poles is available at the concessioner's expense. If your appetite is now whetted for that early autumn tradition of rides, ring tosses and funnel cakes, the 157th annual Bloomsburg Fair is slated for September 24 through October 1 and will feature Kenny Rogers, Cheap Trick, a truck and tractor pull, a demolition derby and much more. Here in York, we don't have to wait quite as long. The York Fair, which claims to be America's oldest3, will be held from September 9-18. 1. A permit fee of $75 in 1950 would be the equivalent of about $671 in 2010 dollars, according to The Inflation Calculator. 2. Anyone know what "skillows" are? 3. From the York Fair's history page: "The traditions of fairs in the New World began with the York Fair, America’s first fair, held in the historic old Town of York in 1765, eleven years before the nation was founded. A charter to hold that fair was granted to the people of York by Thomas Penn, son of William Penn in recognition of 'the flourishing state to which the town hath arrived through their industry.' Those early gatherings were reported to have been 'the liveliest days of the whole year.'"